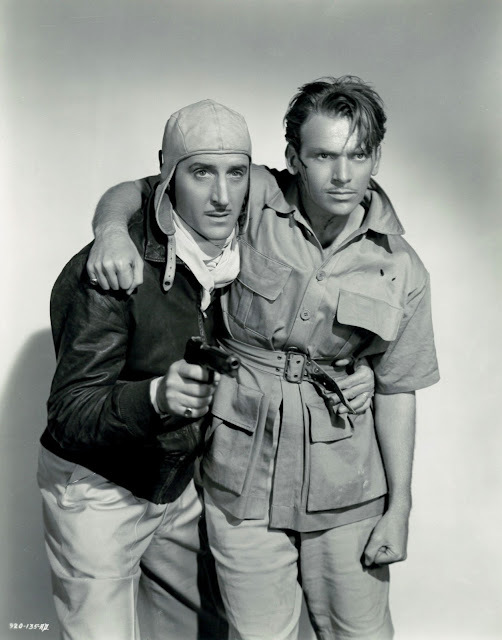 The British Empire upheld by Douglas Fairbanks, Jr. and Basil Rathbone, with encouragement from granddad C. Aubrey Smith. 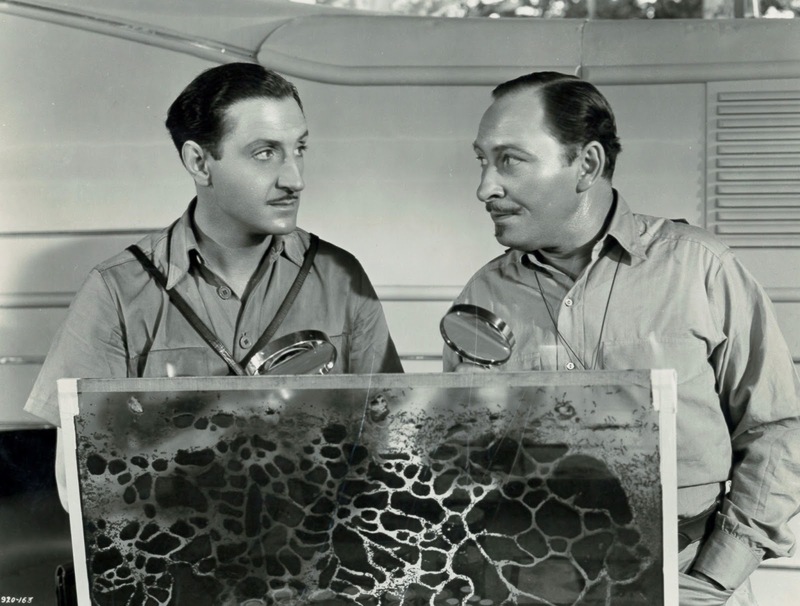 These alone are tip-off to The Sun Never Sets being irresistible, but in case further spur is needed, there is Lionel Atwill as munitions dealer intent on starting World War Two, and just on eve of actual one getting underway. Clearly it's not reality of any sort we're dealing with. 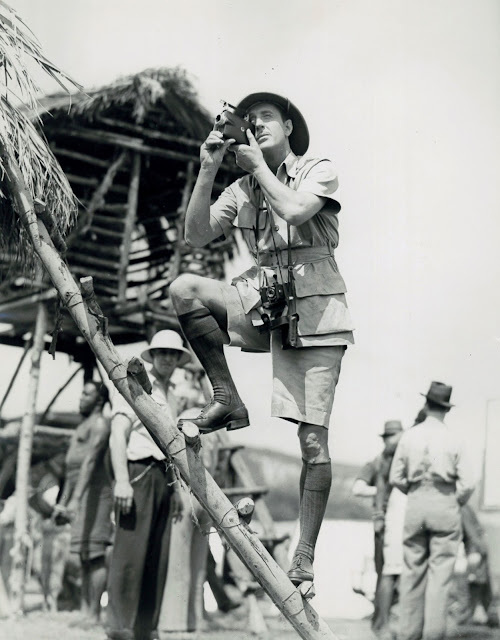 Atwill chooses Africa's Gold Coast as staging area for global conquest, issuing commands from a '39-vintage mobile home, a sleek forebear to RV's we drive today. 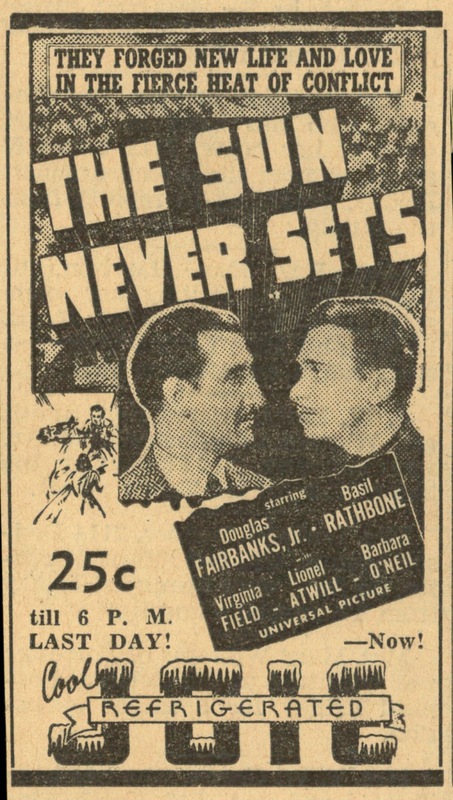 Universal made The Sun Never Sets, a bid for "A" dates, as was two more that year directed by Rowland V. Lee, Son Of Frankenstein and Tower Of London, the trio coincidentally starring Rathbone as well. These are very much a matched set, and essential viewing for whoever grew up with Uni horrors on TV, The Sun Never Sets a first cousin to the Frankenstein pic in terms of dialogue joust between Basil and insidious Atwill. You'd think this was a serial for every twenty minute pause to cliff-hang. In fact, The Sun Never Sets has that too. Children must have loved it, whatever the incredulity of parents that brought them. Young Doug is top-billed. He was lately off The Prisoner Of Zenda and renewed marquee value after sojourn in England and a slump over here. Doug was All-American but could play Brit for having adopted some of their pretensions. On the other hand, he does wicked mimic of lordly types we're otherwise asked to take serious. The Sun Never Sets was really setting sun on this type of melodrama, the for-real war about to sweep that away along with Hollywood (or anyone's) celebration of class distinction, all a more reason to treasure antiquity this is. Duty and honor get a workout, plus ultimate sacrifice for Empire interests, in this case put-down of Atwill scheme, occasion for the film's one-only action spasm. The Sun Never Sets is essentially a B boasting an A cast. There's not even bother of stock footage to simulate Africa, us taking U's backlot for the Dark Continent and liking it. Situations recall The Lives Of A Bengal Lancer and much of imports from Alex Korda, who, of course, led in this field. Too bad The Sun Never Sets is so obscure, not having run since the old AMC used it, from which booted discs came to rescue of collectors unto present day. Mine looks OK provided I don't project on too large a screen. Pity we have to look at it circumscribed, but as with so much ... better than nothing. 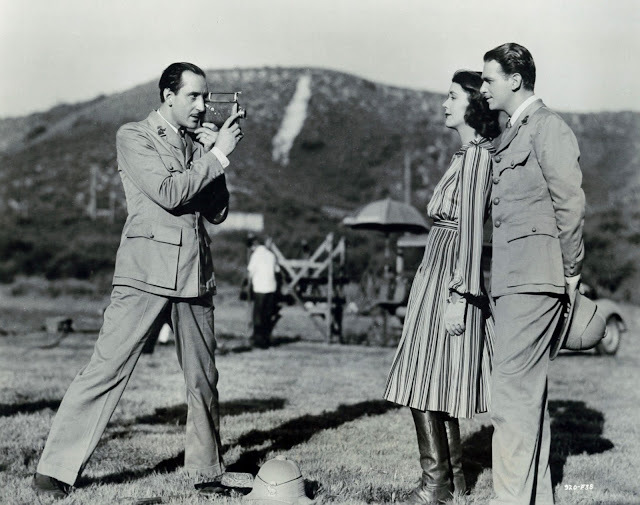 Interesting sidelight to production was Rathbone bringing along his home movie camera to record offscreen action. He had taken such souvenirs from shows done previous --- there are 16mm backstage reels from Romeo and Juliet and The Adventures Of Robin Hood that I know of. Bonus aspect was these being shot in color, and by Rathbone himself, unless he was being photographed. Several stars brought cameras to work, Loretta Young and Tyrone Power among others besides Rathbone. I'm told Ty had a room at home set aside for editing and storage. Linda Christian did an autograph show during the 90's at which I asked if any of his stuff survived. She said not to her knowledge --- who knows but what Power's library ended up with the last wife, or to present day with his children. I know fate of at least a few Rathbone reels, sold by the Player's Club to assist widow Ouida Rathbone several years after Basil's death. Studios eventually forbade cast/crew members shooting their own footage on sets and location. This must have been policy in place by the 40's, for I don't know offhand of home movies extant after the late 30's and late example of The Sun Never Sets (although there are stills of Humphrey Bogart on the Casablanca set with his own camera). I was totally unaware of this movie. Thanks for posting this. Another pairing of Rathbone & Atwill. I enjoyed your new post which refers to Basil Rathbone's home movies. By now I'm sure everybody's familiar with the enjoyable and rare brief look we can get at Boris Karloff in his last outing as the Frankenstein monster, in [Kodachrome] color! 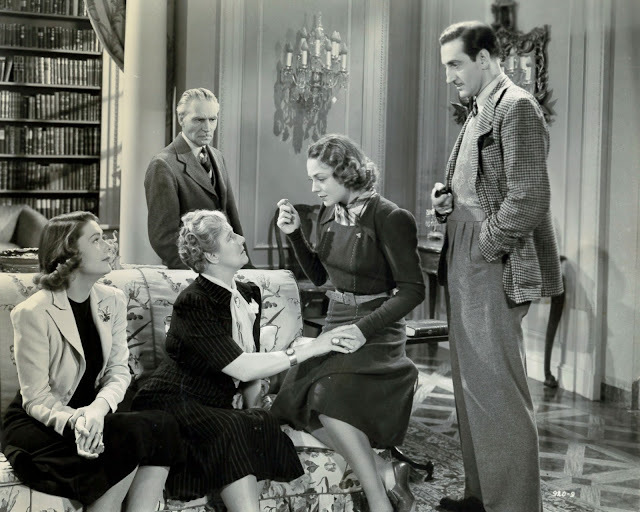 I do NOT know that it's ever been revealed who took those movies, or how they came to be in the hands of the people at A&E who produced the enjoyable Biography (yes, capital 'B') on Karloff. Were they once Karloff's? Were they Rathbone's, begad? Or...whose? One thing that seems possible, off that topic, is that they were slightly boosted in the video domain to punch up the color. Though that would not necessarily have been...er, necessary!...due to the fact that Kodachrome has amazing lasting power. There are still big studio pictures in collections taken on the remarkable film that have retained every BIT of their color, as is proven in an enjoyable coffee table-type book that came out only a few years ago, which was called [this is me, half-guessing, even though I OWN a copy, somewhere...] "Hollywood in Kodachrome". Of course , due to the tastes of those times, most of these pictures---studio gallery stuff---wanted to be colorful over boringly 'realistic', and they are mostly all very high-key, sharp as a tack, and lousy with color. (As in, 'full' of color---far from lousy!) But, the same pertains to many surviving 16mm and even 8mm movies taken on real Kodachrome over about 70 years of the 20th century. I have quite a few reels of my own, and the last I actually looked at them (unfortunately, almost twenty and more years ago), they still looked the same as they did the day I got them back from the processor....which, BTW, was Kodak! ONLY Kodak, and a very, very few licensees, were even ABLE to process this technically-complicated but superior film emulsion. Rathbone looks rather rigid and formal in your (wonderful) stills, but Vincent Price, speaking at a 100 Year Anniversary of the birth of Boris Karloff at the AMPAS in Beverly Hills in 1988 said that both he and Rathbone were great to him on "Tower of London", and both had a great sense of humor. And as we all know, who hold these actors all in such affection, they were re-teamed on "Comedy of Terrors" in 1964, and there is a wonderful posed shot taken on the set by a LIFE still photographer of the three of them, plus Peter Lorre, taking their lunch break in open caskets! The nearly half hour of 16mm color footage shot by Syd Chaplin on the GREAT DICTATOR set is of tremendous historical value. Here's one of the best behind-the-scenes glimpses of kid brother Charlie intently at work, totally in command, completely focused. It also slyly infers Syd's own priorities, since the old lech eats up a lot of filmstock shooting (and apparently talking up) every attractive woman on set! Tiny correction to Craig's note - the Sherwood Forest of ADVENTURES OF ROBIN HOOD was Bidwell Park in Chico, Calif. (not Chino). Dave - does any of that footage include Douglas Fairbanks? Doug visited the set mere days before he died and it was the last time he and Charlie saw each other.